Syowia Kyambi, born in Nairobi in 1979, is a multi-media artist of Kenyan and German origin living and working in Kenya. Syowia graduated from the Art Institute of Chicago and has been the recipient of several awards and grants, including most recently the Art in Global Health Grant from the Wellcome Trust Fund in the United Kingdom. Her work has been shown in museums in Belgium, Finland, Kenya, Mali, Sweden, Germany, Zimbabwe, France, South Africa and the US and she is currently performing in Germany and Ireland. Much of her work dissects and brings into question issues of race, perception, gender and memory, examining how our contemporary human experience is influenced by constructed history, past and present violence, colonialism, family and sexuality. Her current practice is geared towards performance, exploring personal relationships and cultural identities, linking them to issues of loss, longing, race and exploring women’s roles in society. She often blends contemporary methodologies with a quest for traditional knowledge in her practice –video work with clay pots and basket weaving techniques for example - orchestrating an engagement with the viewer in a dynamic process that leaves behind a powerful visual impression. In her practice Syowia has collaborated with other artists, dancers, photographers, video artists and filmmakers. Her performance 'Fracture I' (2011) was shown at the Kouvola Art Museum in Finland at the WIELS Contemporary Arts Center in Brussels. In her ongoing body of work, Between Us, Syowia Kyambi asks the question: to what extent do clothes create an identity and how can social roles be transformed through pieces of clothing. Taking the Kaunda suit as her starting point; a suit that was considered a symbol of prestige in Kenya during African independence movement, is now worn by low-level service staff, the artist examines the way social roles are ascribed and social expectations through various different costumes. How much is clothing to be read as an expression of nationalities, genders and status? What personal traits are emphasised or hidden using clothing? 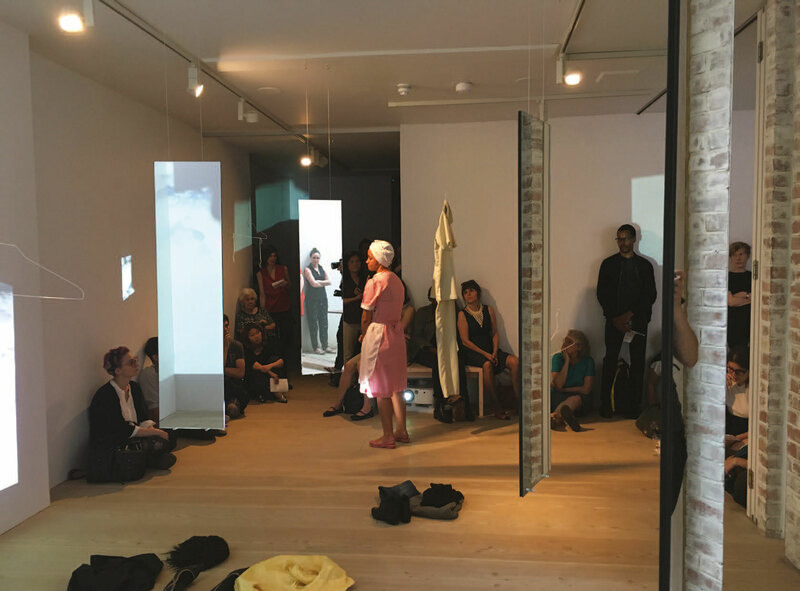 Mirrors installed in the space throw the questions back at the audience and always locate the performance on the line between voyeurism and participation. Syowia Kyambi is a Kenyan-German artist, who investigates how much one’s own biography is influenced by attributions of gender and sexuality, memories, colonisation and experiences of racism. 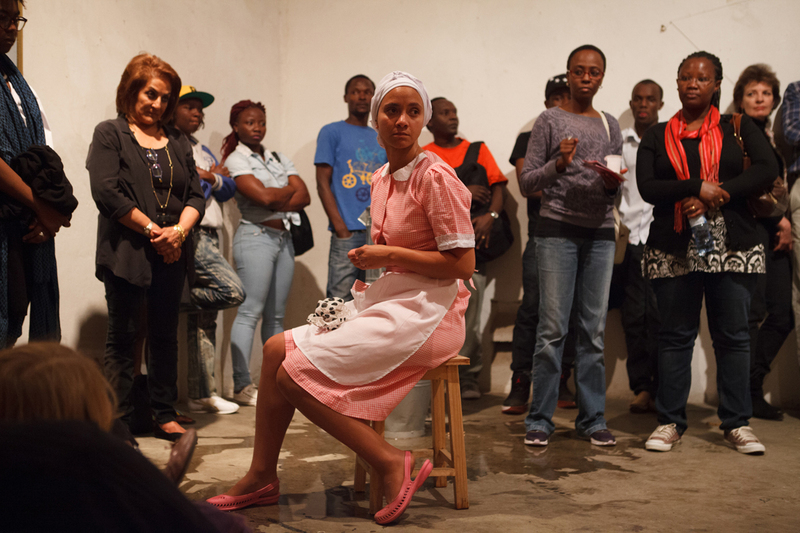 The performance/installation Between Us has already be performed in a different version in Nairobi (2014), London and Dresden (2016).